Day one saw 2 Gold Medals and 3 Bronze Medals. With Philip Kastner winning the U17 men’s Lo ng Jump with a PB of 6.35m and George Sudderick U15 Boys winning the 60m with a PB of 7.17m. Bronze medal winners were Caitlin Paul U13 Girls in the 60m Hurdles and Hayden Evans U13 Boys in the Long Jump with 4.26m. Philip Kastner picking up his second medal, a Bronze for joint third in the 60m Hurdles with a PB of 9.15m. 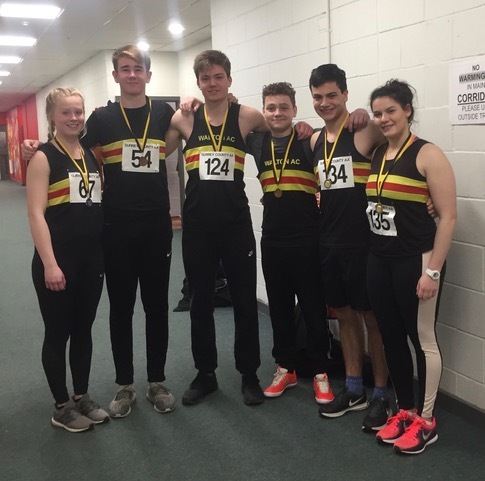 Also running the 60m were Emma Fisher, Hayden Evans, Caitlin Paul, Georgia Russell, Luca Soave, Jasmine De La Touche who all had PB’s. Jasmine De la Touche Long Jumped 4.34m. Day two saw a super medal haul with the Whopping Walton throwers achieving 4 Golds, 1 Silver and 3 Bronze Medals. Sam Mace started the day with a 13.68m PB and won the Gold in the U20 Men. Following this his sister Sophie Mace not wishing to let the side down took the Gold with 11.59m in the Senior Women. Jasmine De La Touche also gained a Silver medal in the U17 Women’s Shot. A Gold came again in the U17 Men for Philip Kastner and a 12.64m PB. Josh Cowie also with a PB 9.25m won the Bronze Medal in the U17 Men Shot. In his first competition Jakob Howe picked up the Bronze Medal in the U15 Boys Shot with 7.20m PB. Finishing the Shot Put events for the day was our new U15 Girls Surrey Champion Georgia Russell with a super PB of 10.91m. Meanwhile upstairs, Tyler Panton picked up the Bronze in the U17 Mens 60m with a PB of 7.28 and Sam Bishop ran a 7.64 PB. Jasmin De La Touche ran a PB 60m Hurdles in 10.50. Our other Senior Woman Jo Flowers ran 8.97 in the 60m. That makes 4 Surrey Shot Champions, 1 Surrey Long Jump Champion and 1 Surrey 60m Champion. Well done to everyone who competed.